One could talk at length of how many times, in the cultures of the old Eurasian peoples, reference is made to this fascinating and elegant bird. Aristotle already cited it in his naturalistic descriptions, but also in the Sumerian culture, in the Indian and even easternmost ones,such as the Japanese and Chinese, the crane is still now part in the folk tradition. But going back to the tradition of old Greece from Herodotus to Homer, from Strabo to Plutarch, all have written something concerning the cranes even if nowadays they would sound like ridiculous legends. They said that the cranes while resting on one leg only did keep a stone tightly in the other one, so that at the slightest hint of sleep, the stone did fall down waking them up. Some others said that the cranes while migrating southwards following the Nile River course actually were looking for its sources for fighting against some small men called Pygmies, inhabitants of the city of Gerania, reference on which we shall come back later one. More, that they kept some stones in their mouth when flying over the Taurus Mountains in Anatolia in order not to emit their usual cries thus not to draw the attention of their eagles, their foes. He who kept a crane bone on himself maintained an unmatched elasticity and strength of shins and legs. The brain of the crane was a love philtre and transformed the even ugliest man in an Adonis, thus getting the graces of all women. In Europe, Boccaccio has thought to remember this bird, inserting in his Decameron the famous third novella of “Chichibìo and the crane” as much famous as illustrative of the amusing and funny behaviour of the courts in the Middle Ages. Chichibì , cook of Messer Currado Gianfigliazzi, did serve for lunch a delicious crane missing of one thigh the smart cook had earlier given to his beloved Brunetta. 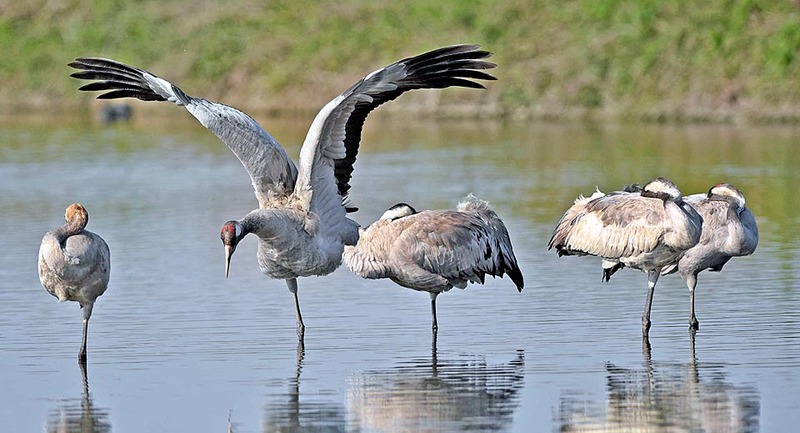 To the immediate complaint of the Sir, the cunning Chichibìo clearly replied that the cranes had only one leg and that one could get the proof of this, going close to the nearby marsh where these birds had the custom to rest. Once in loco they realized that effectively all the cranes were perched on one leg only but with a simple call by Sir Currado they immediately stretched the second leg and took the flight. Whereupon, the smart but also naive Chichibìo could not answer anything else than with a joke later become famous: Yes Sir, but you did not shout – ho ho – to the yesterday evening one; because, should you have shouted, she would have consequently stretched the other thigh and the other foot, has have done these. So then, with his quick and funny answer, Chichibìo ceased the bad luck and pacified with his Master. A first consideration highlights that in the Middle Ages this bird was fairly common and formed part of the culinary delicacies of the time, conditions both disappeared during the following centuries. Finally, two small curiosities. The Greek term “ghèranos” = crane, has given name to our geranium (Geranium sp.) as the fruit of this plant has the shape of a crane beak. In Japan, offering an origami showing the crane, is the best wish for the beloved persons. The crane is a bird that by sure does not go unnoticed seen the size and the penetrating, continuous and very strong call it continuously emits while flying. A croak audible kms far away emitted while it flies in our skies in a perfect V formation. Nowadays it is a bird no longer pertaining to the avifauna nesting in Italy and only during the migrations we can observe individuals stopping in our territory, resting for some days during their very long migratory travel. 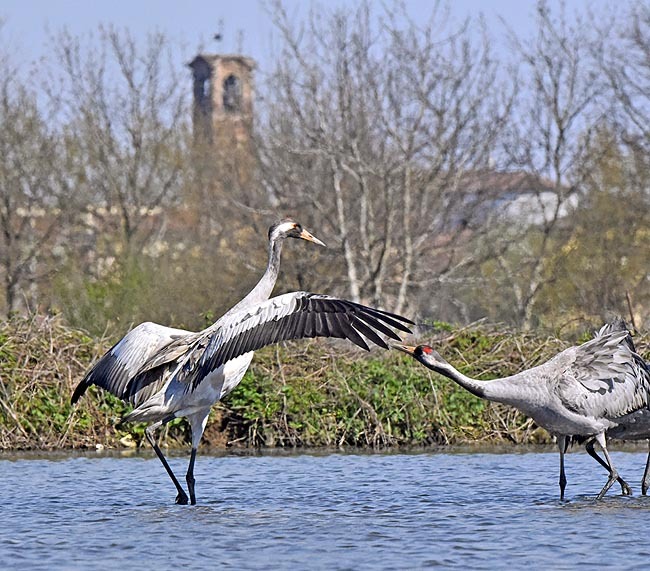 The Common crane or Eurasian crane (Grus grusLinnaeus, 1758) belongs to the order of the Gruiformes and to the family of the Gruidae and is the only member of this genus nidifying in Europe. This family includes in turn two subfamilies, the Balearicinae (the so-called crowned cranes) and the Gruinae (the typical cranes), group where is placed our Eurasian crane. 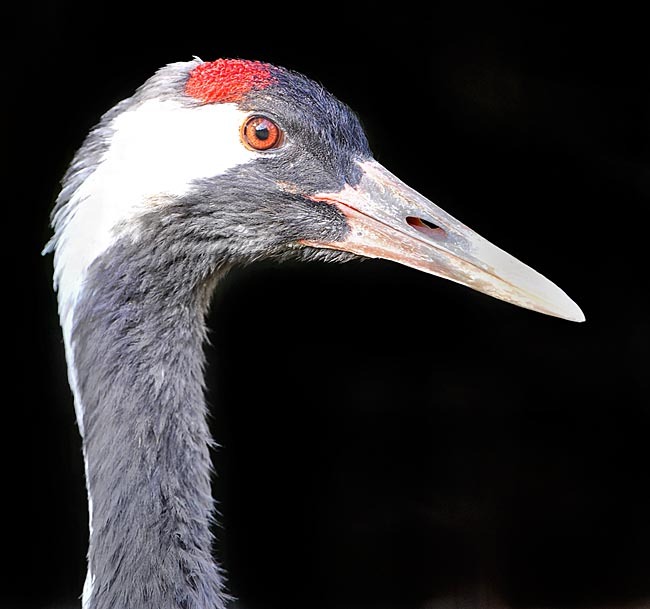 Other common European names: Common crane in English; Grauer Kranich in German; Grue cendrée in French; Grou comun in Portuguese; Grulla común; in Spanish and Gru cenerina or Gru euroasiatica in Italian. 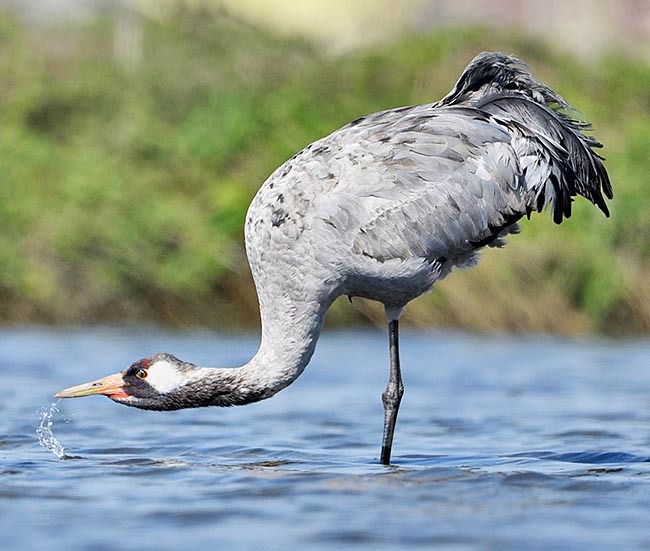 The common crane is the crane having the vastest range and along with the more rare Demoiselle crane (Anthropoides virgo) one of the few that can be observed in Europe. It lives in the cold temperate belt of Asia and Europe, from the coasts of the Scandinavian Peninsula up to Pacific going down to lower latitudes in the north of Germany and Poland and in the Central Asian republics with an isolated exception in Turkey and in the Caucasian area. North, it reaches Lapland and east, the whole Russian Siberian tundra occupying the immense wetlands of the Pechora, the Lena, Ob and of Yenisei, that are the main reproduction basins. It is an exceptional migrant covering thousands of kilometres to reach the winter quarters located in China, in the north of India and in the Tigris and Euphrates Valleys for the Asian Siberian populations and East Africa in the Nile River and in Ethiopia for the European and east-Asian ones. Some individuals winter in the Iberian Peninsula and occasionally, in quite reduced numbers, also in France and in Italy. They are trying to reintroduce it in England, in Ireland, Hungary and in other areas formerly frequented by this bird. In Italy, it has nidified till the beginning of the last century, in the time preceeding the great reclamations but it is thought never in a consistent number. It may be noted, keeping in just consideration the relationship between the territory occupied during the nidification and the wintering areas, how reduced are these last ones. As a matter of fact, in the winter quarters the cranes gather in numerous flocks, with thousands of individuals whilst in the nidification time it keeps an isolated life, we might say, ascetic. Impressive are the flocks that can be seen in the heart of the northern winter, around the Lake Tana in Ethiopia and in the swamps of Velavedar in Gujarat, India. In the nidification areas it can be met up to 2.000 metres of altitude whilst in the Ethiopian wintering zones it can easily reach the 3.500 m.
The common crane is a typical bird of the swampy tundra, formed by persistent marshes, dotted with small islands partially emerging from the water, in isolated areas and difficult to access by land, covered by light and low bushy vegetation, habitat that gives the possibility this big bird of nidifying sheltered from most of the terrestrial dangers. At times, it lives also in woody zones but always close to vast open spaces where it can graze and keep under control the surrounding territory. Conversely, in winter, in the resting areas during the migration as well as in the winter quarters, it often takes advantage from cultivated fields, cereals stubbles, rice fields, horticultural productions with preference of soils object of particular cultivations, such as potatoes, corn, beans and soy, where it finds a huge quantity of food, gleaning the fruits forgotten on the ground. The crane is always a choice prey for all predators. A fair quantity of meat or some big eggs can satisfy the alimentary requirements of many mouths. However, getting close to the crane is not easy for the tundra predators, revealing even dangerous, due to the fury this bird shows while defending the nest and due to the strength it can exhibit against the intruder. The common crane defends kicking with its large and sturdy legs, inexorably hitting the predator with its powerful and sharp beak, parrying anyone, widening and hitting the opponent with its big and robust wings, without leaving the least escape. Unluckily, one of the most worst enemies are the corvids who, smartly, are often able to send away the common crane from the nest with fake diversions and to subtract secretly the eggs or the helpless nestlings. In any case, the common crane keeps a population ensuring a remarkable reproductive success and well far from the survival risks. The common crane is a faithful migrant and retraces every year the same routes, halting regularly in the same known and previously frequented places, getting then invariably in the same winter quarters since always occupied. Its migratory routes are known since ever and are often, for the populations living in the flown over territories, marks of the seasonal change or, in the old times, also markers of omens and prophecies. Like all cranes, the common crane is very noisy and during the migrations, when flying very high over our heads, it is much easier to hear them than to see them. Its continuous, persistent and persistent “kuru kuru” emitted by these birds to maintain the contacts while flying, can be heard from considerable distances. Maybe due to its established characteristic it has entered the popular tradition as the archetype of the term migration. 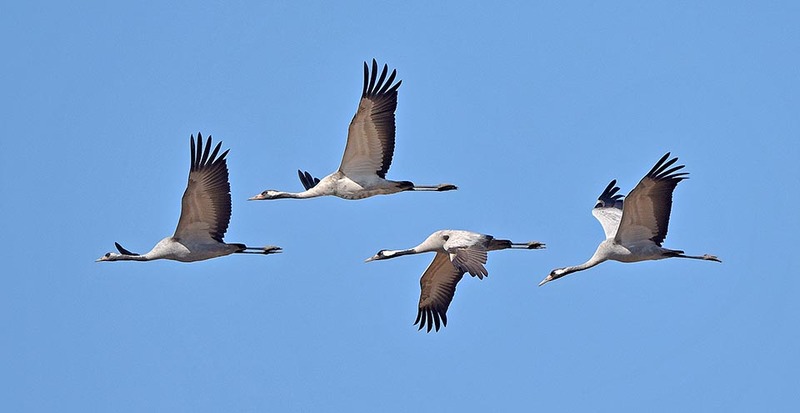 As a matter of fact, it is sufficient to say crane to think to the migration of the birds and this is well known in the literature of any time and the various popular traditions. 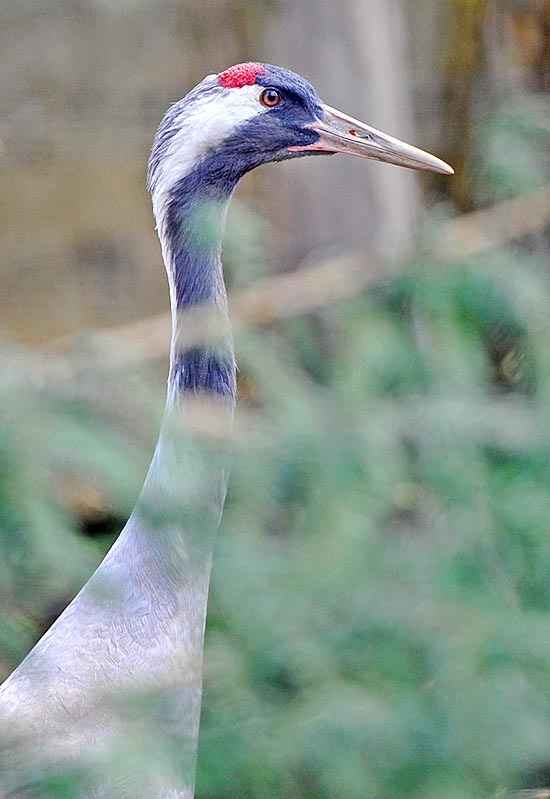 The crane has a very varied diet passing indifferently from roots, grass and tubers to wild fruits, cereals and various seeds as well as to small birds, eggs, mice, amphibians, fishes, reptilians, big insects and snails. It eats also berries and probably this particularity stands at the base of the Anglo-Saxon name of cranberry given to it. 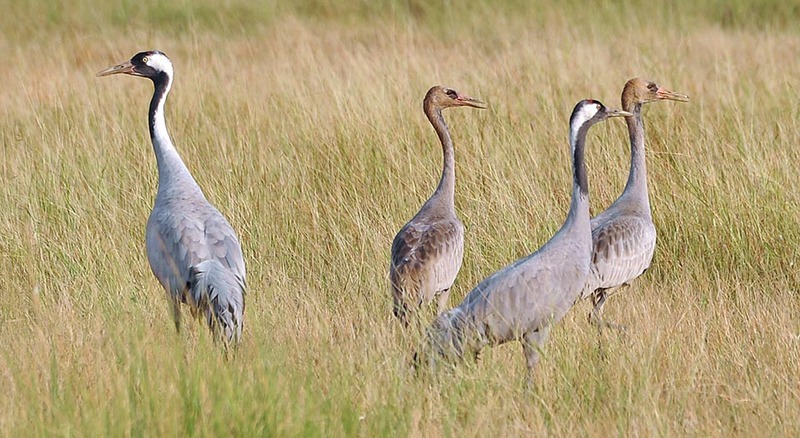 The common crane is bird of remarkable size even if not the biggest among the gruiformes. It has a length of 115 cm, weight up to 6 kg and a wingspan of 2 m. As the name states, this crane has a livery almost totally grey ash, with black truncated tail, done by feathers forming an awkward rounded panache that rises like a chignon at the end of the body. Part of this relief is formed by secondary remiges that are very elongated and that, in the final part, assume the black colour. The neck is always grey ash with more blackish hue whilst the head is black in front crossed by a white stripe going down from the eyes up to the nape and on the rear neck. On the head both sexes have a bright red hairless area forming a hood typical of this species. Also the adults’ eyes are red whilst in the juvenile phase the colour is initially brownish to become, year after year, redder and redder. It has very long legs, robust and stocky, equipped with much elongated toes and having strong nails, legs suitable for walking on uneven and flooded surfaces, typical of the habitats frequented. The beak is massive, pointed and much robust the crane uses strongly as a real pickaxe for digging into the soil looking for roots. The young have a much more modest livery and without the particularities of the adults. They have an ocher yellow colouration all over the body and lack of the typical black chignon shaped tail. Gradually, during the first three years, the young common cranes modify their look resembling more and more to the adults till when they reach the typical ash coloured livery. The common cranes are subject every two years, to a drastic moulting of the primary remiges that render them unable to fly for some weeks. 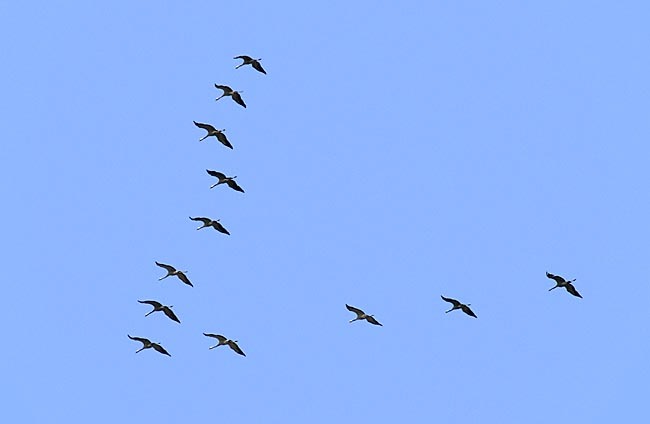 During this period, that precedes the migratory movement, these birds gather in even numerous groups, in inacessible locations where they can hide and escape the terrestrial predators. Their shelters are usually areas covered by high reeds or deep swamps and impassable marshes. Though such a moment is so delicate, it seems that the same is surmounted without any particular difficulty. 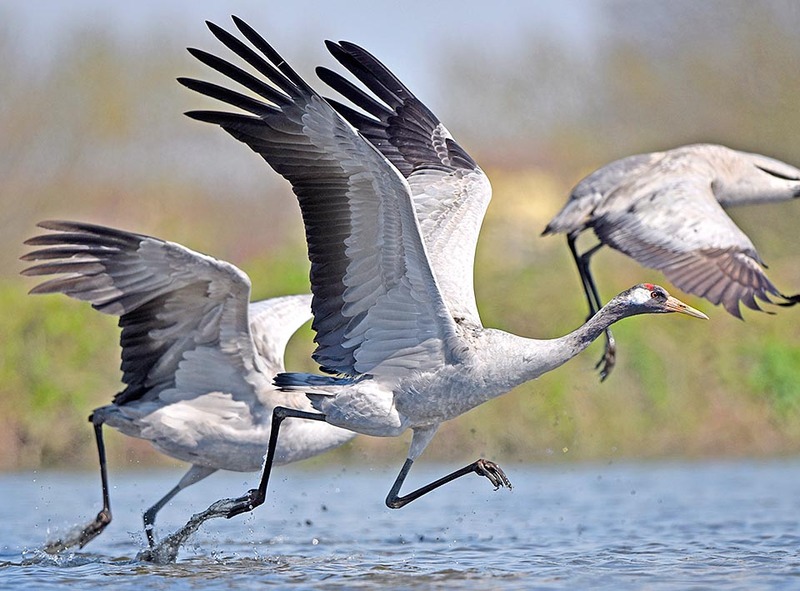 As early as the month of March and lasting through May, the common cranes begin to come back to their nidification quarters, placed up to the extreme north of the Eurasian continent. The tundra and the vast swampy areas inside the taiga are its preferred areas of nidification. Once these territories are reached, the couples disperse looking for isolated sites where to place the nest, whilst the young and the not nidifying adults keep united in small groups continuing an assiduous social life. The nest is placed on a soil just emerging from the water level and built carrying dried grasses, sedges and twigs up to form a platform ensuring a good water insulation. Sometimes, the same nest is used also in the following years, thus showing a strong attachment to the native territory. The pairs are stable for many years and the changes of partners rarely occur. The pair bond is anyway always maintained through the famous courting parades that are done all over the year also outside the nuptial period. Jumps with open wings, bows and runs, pirouettes and sways of the neck, the whole accompanied by the usual hoarse, terrible and abitual cackle emitted by both partners. Usually, two eggs are laid, of cream colour with ample brown spots, occasionally 3 or 4 and the hatching is almost exclusively entrusted to the female only, with the male always lurking around in defense of the nest. Their natural foes are gulls, crows and large birds of prey (Eagles, Buzzards and Harriers) as well as mustelids and foxes. All the animals and the birds are boldly tackled directly, with very fierce and mostly victorious fights, only in the case of man they limit to simple cackles and cries of alarm. The brooding lasts about 30 days and the chicks remain unable to fly for at least ten weeks even if the nest is immediately abandoned after a few hours from the birth. After only one day they are in condition to follow their parents while looking for food, hiding, if needed, on the soil, helped in this by their highly camouflaging livery. During this time the adult common cranes perform that particular moulting that renders them unable to fly thus remaining with the kids hidden in the surrounding habitat. The families migrate together and spend the first winter in the African and Asian quarters joining the thick migratory flocks. The maturity is reached after the three years or even more, and the species may live more than 30 years. For this reason and for the good number of specimens present in the various populations, the species is not considered as endangered. → To appreciate the biodiversity within GRUIFORMES please click here.